Pacific Beach is a neighborhood in San Diego, bounded by La Jolla to the north, Mission Beach and Mission Bay to the south, Interstate 5 to the east and the Pacific Ocean to the west. While formerly largely populated by young people, surfers, and college students, because of rising property and rental costs the population is gradually becoming older and more affluent. "P.B.," as it is known as by local residents, is home to one of San Diego's more developed nightlife scenes, with a great variety of bars, eateries, and clothing stores located along Garnet Avenue and Mission Boulevard. Pacific Beach was developed during the boom years of 1886-1888 by D. C. Reed, A. G. Gassen, Charles W. Pauley, R. A. Thomas, and O. S. Hubbell. It was Hubbell who "cleared away the grainfields, pitched a tent, mapped out the lots, hired an auctioneer and started to work". To attract people, they built a race track and the San Diego College of Letters, neither of which survive today. A railway also connected Pacific Beach with downtown San Diego, and was later extended to La Jolla. As with many Californian cities, the history of its development can be traced back to the completion of a cross-country railroad in the late 1880s. In 1902, lots sold for between $350–700 for ocean-front property and by 1950, the population of Pacific Beach reached 30,000 and the average home sold for $12,000. Nonetheless, a small number of farms remained. Today, homes can sell for millions. The United States Navy operated an anti-aircraft training center at Pacific Beach during World War II. During the 1960s, development continued to increase with the city’s investment in Mission Bay Park, including the developments of the Islandia, Vacation Village and Hilton Hotels. In 1964 Sea World opened, which is located only a few miles from Pacific Beach. The original name of this feature was "Bay Point" and today one may still find a USGS bench mark and associated RM (DC1025, DC1026 respectively) with that name there. The "Bay Point Formation" is the name of a local rock strata first found and described there. Pacific Beach public schools are part of the San Diego Unified School District. They include Mission Bay Senior High School, Pacific Beach Middle School, Pacific Beach Elementary, Kate Sessions Elementary, Barnard Elementary, and Crown Point Elementary. The nonprofit Pacific Beach Town Council promotes the area and organizes community events. The Pacific Beach Planning Group advises the city on land use and other issues. The Pacific Beach and Mission Bay Visitor Center provides information on the Pacific Beach Town Council, special events, lodging, dining, and Pacific Beach history. Service clubs include Kiwanis, Rotary, Lions Club, Girl Scouts, Pacific Beach Woman's Club, Surf Club, Friends of the PB Library, PB Garden Club, and Toastmasters. Pacific Beach is serviced in print by the daily San Diego Union Tribune and the weekly Beach & Bay Press. Pacific Beach is one of the main centers of nightlife in San Diego. Garnet Avenue, between Ingraham Street and Mission Boulevard, is where many bars and restaurants are located. The nightlife in Pacific Beach caters to a younger crowd than the nightlife in downtown San Diego. Robert Young, Producer of the Nationally-Syndicated radio program "The Dr. Demento Show"
Wikimedia Commons has media related to Pacific Beach. ^ "Community Profiles Pacific Beach - City of San Diego Official Website". www.sandiego.gov. Retrieved 15 April 2018. ^ "Pacific Beach". www.sandiego.com. Retrieved 2018-02-09. ^ a b "Locker, Z.B., "Whatever happened to Izard Street?" Journal of San Diego History, 1976". sandiegohistory.org. Retrieved 15 April 2018. ^ Fetzer, Leland (2005). 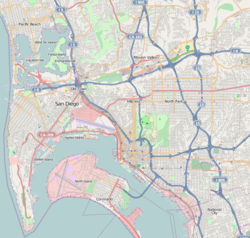 San Diego County Place Names A to Z. San Diego: Sunbelt Publications. p. 108. In 1869, the site of the district's first race track, Agricultural Park ... promoters founded Pacific Beach Subdivision in 1887. Here they erected the San Diego College of Letters ... When it failed, its buildings became the Hotel Balboa. ^ Valentine, James William (1 July 1959). "The Bay Point Formation at its type locality (Calif), (Part) 1 of Pleistocene molluscan notes". Journal of Paleontology. 33 (4): 685–688. Retrieved 15 April 2018 – via jpaleontol.geoscienceworld.org. ^ "Pacific Beach Town Council". www.pbtowncouncil.org. Retrieved 15 April 2018. ^ "Pacific Beach Planning Group - City of San Diego Official Website". www.sandiego.gov. Retrieved 15 April 2018.